PRINCETON, NJ -- Americans' basic opinions of President Barack Obama and key congressional leaders are worse today than they were prior to the government shutdown. Net favorable ratings of Obama, House Speaker John Boehner, and Senate Republican Leader Mitch McConnell are at least 10 percentage points lower than before, with a smaller five-point decline for Senate Democratic Leader Harry Reid. House Democratic Leader Nancy Pelosi's image has by contrast improved slightly, but remains more negative than positive. The latest results are based on Gallup's Oct. 3-6 poll, conducted in the first few days after the government shutdown. 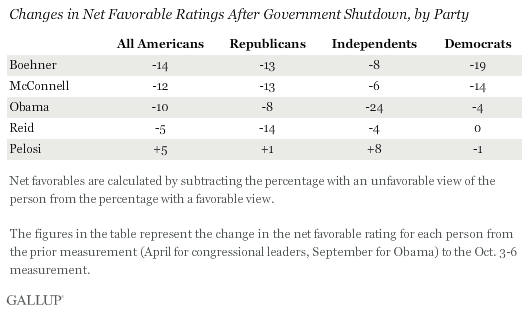 Gallup previously reported drops in congressional approval and favorable ratings of the political parties since the shutdown began. The Republican congressional leaders, Boehner and McConnell, appear to have taken a slightly larger hit from the shutdown than the Democratic congressional leaders Reid and Pelosi, as well as President Obama, given slightly larger declines in the Republicans' net favorables. That is consistent with the greater recent drop in Americans' favorable ratings of the Republican Party than of the Democratic Party. As the table indicates, there has been more movement in Washington leaders' unfavorable ratings than in their favorable ratings. The favorables of Obama, Boehner, and McConnell are down four points each, while their unfavorables have gone up between six and 10 points. 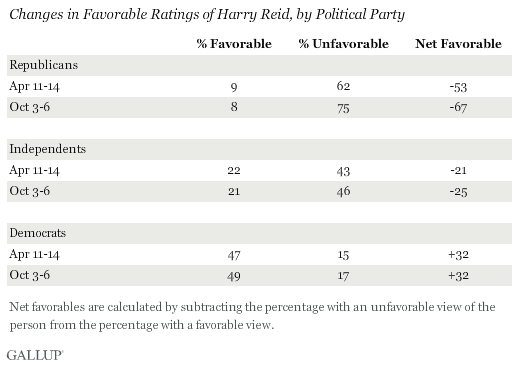 Reid's favorable rating is unchanged, but his unfavorable rating has increased by five points. Boehner's net favorable rating of -24 is the worst among the Washington leaders, and his is the only unfavorable rating above the majority level. 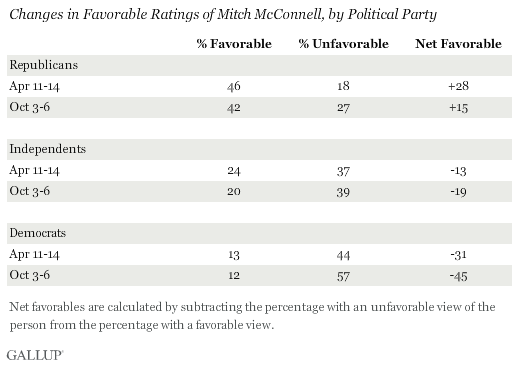 The current net favorable ratings of Boehner and McConnell are now the worst Gallup has measured for each. 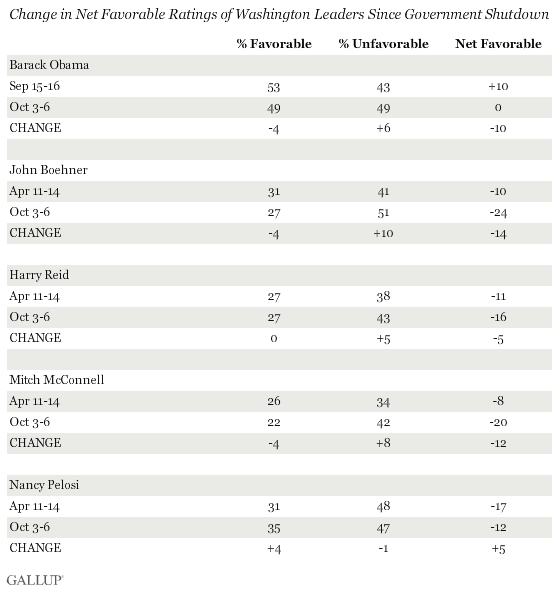 Reid's -16 net favorable nearly matches his worst, -18, found right after the 2010 elections. Obama's net favorable rating of zero is only slightly better than his previous worst, -3, in October 2010. But in spite of the decline in Americans' basic opinions of him, his job approval rating hasn't changed much. His latest Gallup Daily job approval rating, based on Oct. 6-8 tracking, is 44%, compared with an average 45% rating in the week before the shutdown. Texas Sen. Ted Cruz, although not one of the Republican Party leaders, has been a central figure in the recent budget debate, given his more than 20-hour filibuster of the Senate continuing resolution bill. He is now much better known -- 62% of Americans have an opinion of him now, compared with 42% in June. But his higher profile has put him in a much less positive light among Americans, with his net favorable rating down 16 points, from a +6 net favorable (24% favorable, 18% unfavorable) in June to -10 (26% favorable, 36% unfavorable) today. Republicans and Democrats don't agree on much, but both groups now view Republican leaders Boehner and McConnell significantly more negatively than before the shutdown. Their net favorable ratings have declined between 13 and 19 points among the party groups. Republicans and Democrats also view President Obama slightly more negatively than before, but independents' views of Obama have taken a stronger negative turn, with his net favorable down 24 points among this group. Republicans' views of Reid are now even more highly negative, but Democrats' views of him are unchanged. Views of Pelosi, alone in not being more negative now than before the shutdown, are essentially unchanged among Republicans and Democrats, but more positive among independents. The full data on the leaders' favorable and unfavorable ratings by party can be found on page 2 of this story. Americans certainly are not embracing the government shutdown, as they now mention "government dissatisfaction" as the most important problem facing the country, and their negative feelings toward the two parties and party leaders are increasing. Americans appear to be directing a greater share of this negativity toward Republicans -- clearly in their favorable ratings of the parties as well as their opinions of party leaders. And as was the case with party ratings, rank-and-file Republicans seem to be taking a dimmer view of their own party's leaders after the shutdown than Democrats are taking of theirs. Leaders in both parties are almost certain to be paying attention to public opinion data after the shutdown to gauge how Americans are evaluating the parties' positions. And Americans' continuing reactions to the existing shutdown and coming debate over the debt limit will likely help shape the strategy each party takes in attempting to resolve both issues.